Parisian decadence in the heart of New York: what else could you expect, with a hotel that bears the name of the legendary French crystal company? 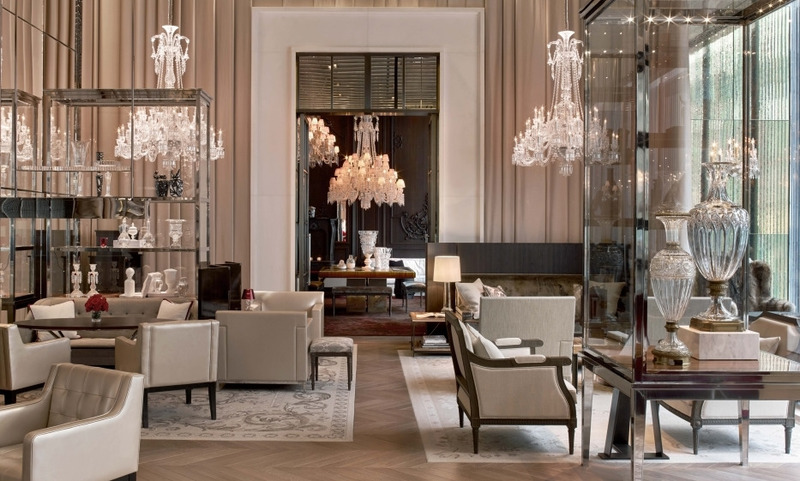 The Baccarat Hotel & Residences New York's aesthetic is sumptuous: the hotel glistens with crystal at every corner in the lobby, a dazzling light installation of Baccarat Harcourt glasses and throughout the hotel mood lighting, herringbone wood flooring, and rich, lavish fabrics, courtesy of design duo Gilles & Boissier. Lest you think that you’ve somehow crossed the Atlantic, the hotel is located smack-dab in Midtown, across the MoMA, and a stroll away from the Rockefeller Centre. All beverages are elegantly served among a stunning array of magnificent Baccarat crystal glassware. Discover the most intimate luxury hotel in Manhattan with only 114 guestrooms and suites offering a discrete and profoundly personal experience. Be pampered at La Mer Spa with custom treatments, marble indoor pool and fitness center providing the ultimate in wellness and relaxation. A very classy hotel that’s well located and offers personalised service. The architecture and decoration are exceptional. I highly recommend this hotel. Gorgeous dining room and impeccable service. Will definitely come back if I visit New York again.